So much for the trade truce rally. One day after it emerged that nobody in the Trump administration has any clue about what was actually agreed upon during Saturday's historic "dinner date" between Trump and Xi, Monday's market "sugar rush" hopium fizzled and as we previewed yesterday, has turned into a vicious hangover, with US equity futures dropping and European shares tracking declines in Asia despite a modest recovery from Chinese stocks into the close as investors curbed their enthusiasm over any breakthrough in the trade war. 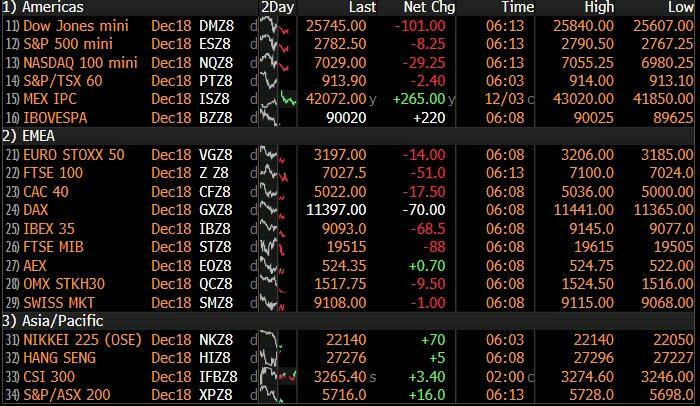 S&P 500 futures indicated U.S. shares would give up much of their Monday’s gains at the New York open, while the Stoxx Europe 600 Index slipped led by the same automakers which surged yesterday on a Trump tweet about China dropping car tariffs, which has since been largely disproven. Markets slumped across the globe, with world stocks knocked off a three-week high as a result of dashed hopes of a swift resolution in the US-China trade war after media appearances from Trump administration officials shed little light on the specifics of any Sino-American trade agreement, while growing fears the U.S economy could be headed for recession sooner than expected weighed on the dollar. As Bloomberg notes, the optimism that drove Monday's gains quickly dissipated as investors scrambled to figure out exactly what, if anything, was agreed between the U.S. and China on trade at the weekend. Treasury Secretary Steven Mnuchin and President Donald Trump’s top economic adviser, Larry Kudlow, dialed back expectations and added qualifiers when asked about the outcome of talks between Trump and Chinese President Xi Jinping. China’s government did not help the mood as it was unable to formulate its response to the trade summit - three days after its conclusion - as senior officials are still out of the country with President Xi Jinping. China has said nothing about the commitment to remove car tariffs flagged by the U.S., nor did its statement mention the 90-day timeline for talks the Americans have specified. Following declines on Asian bourses, where Japan’s Nikkei stock index closed 2.4% lower, even as shares in Shanghai and Hong Kong fared better, fluctuating before ending higher as the yuan climbed, the mood was somber in Europe with the wider blue chip index slipping 0.3 percent. Frankfurt’s DAX and Paris’ CAC 40 fell 0.6 percent while MSCI’s index of world stocks declined 0.1 percent. "The initial relief rally was never going to last. Investors need more detail now in order for that risk on sentiment to survive,” said Jasper Lawler, head of research at London Capital Group. “So far that detail has not been coming through and investors have more questions than answers." Adding to market woes, was an inversion of the short end of the U.S. yield curve which foreshadowed the end of the Federal Reserve’s tightening campaign and raised the specter of a possible U.S. recession. The curve between U.S. three-year and five-year and between two-year and five-year paper inverted on Monday - the first parts of the Treasury yield curve to invert since the financial crisis, excluding very short-dated debt; meanwhile the closely watched 2s10s just 13 basis points from inversion. On Tuesday, the yield on benchmark 10-year Treasury notes dropped as low as 2.94%, sliding below its 200DMA for the first time since September 2017. German/U.S. yields moved in tandem, with curves bull flatten as the focus on curve inversion gains momentum. Long-dated Gilt yields drop 3bps, dragging peers lower, short dates underpinned by steady demand at the 2024 auction, although attention remains squarely on Brexit developments. Fed Chairman Jerome Powell was scheduled to testify on Wednesday to a congressional Joint Economic Committee, but the hearing was postponed because of a national day of mourning for U.S. President George H.W. Bush, who died on Friday. Elsewhere oil continued to find support, and extended gains, adding to Monday’s 4 percent surge as investors bet a key OPEC meeting on Thursday could deliver supply cuts in the wake of moves by producers to address a supply glut that contributed to a 15% tumble in West Texas Intermediate prices last month. U.S. crude and Brent crude added 1.6 percent to $53.82 and $62.7 per barrel respectively. Later in the session oil pared some gains after Saudi Oil Minister Khalid Al-Falih said it’s too early to say whether OPEC and its partners will cut production. Gold hit a session high of USD 1238.83, reaching its highest value since the end of October, as the dollar continues to weaken on a decline in US yields following the positive G20 trade outcomes. Steel futures have hit a 7-month low as prices are pressured by the oversupplied market, this comes after the positive sentiment seen in base metals on Monday from US-China trade developments. Separately, palladium (+1.0%) hit a record high of USD 1221.95 earlier in the session. On today's economic calendar, no major economic data are expected. AutoZone and Dollar General are among companies reporting earnings. Asian stocks traded mostly negative as the relief rally fizzled out in the region with investors quick to book their recent profits. ASX 200 (-1.0%) and Nikkei 225 (-2.4%) were lower from the open in which a pullback in consumer and energy stocks led the downside in Australia and with Japanese sentiment dampened by a firmer currency. An indecisive tone was seen in the Hang Seng (-0.5%) and Shanghai Comp. (-0.2%) amid a lack of fresh drivers and as participants await the next developments of the US-China trade saga with China reportedly considering possibilities of lowering US auto tariffs. In addition, US Treasury Secretary Mnuchin was said to be hopeful for an agreement but warned tariffs will be implemented if a deal fails to materialize, while China reportedly censored a post by the US Embassy regarding the recent trade developments and tariff ceasefire which some have suggested could be a possible effort to avoid looking weak or that it gave in to US pressure. Finally, 10yr JGBs traded higher amid the risk averse tone and as they tracked the overnight gains in T-notes. This coincided with the US 10yr Treasury yield dropping below its 200DMA for the first time in around a year, while the US 2yr/10yr spread continued to narrow to its flattest in over a decade. Today also saw a 10yr auction from Japan, although there was a muted reaction as the auction bore mixed results. European equities have kicked the session off with modest losses (Eurostoxx 50 -0.5%) as markets take a breather from yesterday’s “trade truce” inspired gains. The CAC 40 (-0.6%) is showing some marginal underpeformance relative to its peers in what has been a difficult start to the week for French equities amid domestic protests over the weekend, albeit tensions might show some signs of abating following reports that the French PM is to halt the proposed fuel tax hike. Elsewhere, sectors are relatively mixed thus far with mild outperformance seen in energy names (in-fitting with price action in the complex). Consumer discretionary stocks are a clear underperformer with Volkswagen (-2.2%), Porsche (-2.0%) and BMW (-1.9%) all lower after German car registrations fell 10% Y/Y. Postal names are softer in Europe following a disappointing update from BPost (-20.4%) which has sent their shares to the foot of the Stoxx 600, dragging Post NL (-5.3%) and Deutsche Post (-1.7%) lower in sympathy. In terms of individual movers and shakers have predominantly been the result of broker moves with Rightmove (+1.8%), JC Decaux (-3.3%), BAE Systems (-4.9%) and Continental (-4.0%) all gaining traction as a result of rating action. In FX, DXY – On the backfoot again with the index retreating further from 97.000 to trip stops at 96.400 and register a fresh post-G20 low of 96.372. This against the backdrop of broad Dollar losses vs. its major counterpart and a sharp retreat in US Treasury yields with the long-end of the curve outperforming. EUR – Also benefitting from the Greenback’s misfortunes and hopes that Italy vs. EU fiscal friction may be resolved amidst latest reports that PM Conte will deliver another revised 2019 budget draft with deficit circa 2.0%. EUR/USD back above 1.1400 (with 1.234bln option expiries between 1.1400-05) but just stopped short of a key Fib at 1.1424. JPY, GBP – Major G10 outperformers with cable briefly breaching yesterday’s high of 1.2825 (vs. intraday lows of 1.2720), absorbing offers around 1.2800-1.2820 on the way to a peak of 1.2839. The Pound may have derived support from another UK PMI beat (construction) having already gained impetus after the ECJ’s senior advisor stated that the UK can revoke Article 50 unilaterally (under certain conditions). The single currency vs. the pound holding just above 0.8900 vs. lows of 0.8890 with stops reported at 0.8950 (though some distance away). To the downside, 0.8861 is reported to be a support level. Elsewhere, the JPY is taking advantage of the ongoing buck decline and a marked downturn in risk sentiment after initial US-China truce euphoria, with USD/JPY taking out the Tenken line at 113.34, a Fib level at 113.17 and the 55DMA at 113.05 to hit a low of 112.75 (ahead of the psychological 112.50 and the 100-DMA at 112.25). EM –Turkish Lira remains pressured by the ongoing recovery in oil prices (large net importer). USD/TRY trading around 5.30 with concerns that the Central Bank may prematurely loosen policy (aided by the slowdown in CPI) also weighing on investors’ minds. However, the ZAR is the clear EM outperformer amid the latest SA GDP figures showing the country has recovered out of recession, while a rally gold (major producer) is also providing the Rand with impetus. Finally, CNY undergoes another day of strengthening in a continuation from the G20 momentum. USD/CNY trading comfortably below 6.8500 after the PBoC set the strongest Yuan fix since June last year. In commodities, Brent (+2.2%) and WTI (+2.2%) have continued to rise on expectations for a cut at the upcoming OPEC+ meeting, with any cut likely to take into account the reduction to Canadian output which is also supporting oil prices. Prices came off highs after Saudi Energy Minister Al-Falih stated that it is premature to suggest that OPEC+ will reduce output at the meeting this week, in turn hinting division amongst OPEC members. Initial source reports suggest that OPEC+ are working towards a minimum output cut of 1.3mln BPD from the October levels. However, Russia’s position of a maximum output cut of 150k BPD is the main obstacle to this, as OPEC want a minimum cut of 250-350k BPD. With sources suggest that OPEC may delay cuts if Russia does not agree to a substantial output cut. Looking ahead we have API data later in the day, with expectations being that crude stocks fell by 2.25mln/bbl for the week; if expectations prove accurate this will be the first crude oil draw since mid-September. Additionally, the weekly EIA release has been pushed back to Thursday at 16:00 GMT, due to the national day of mourning for Former President George H.W. Bush. Gold hit a session high of USD 1238.83, reaching its highest value since the end of October, as the dollar continues to weaken on a decline in US yields following the positive G20 trade outcomes. Steel futures have hit a 7-month low as prices are pressured by the oversupplied market, this comes after the positive sentiment seen in base metals on Monday from US-China trade developments. Separately, palladium (+1.0%) hit a record high of USD 1221.95 earlier in the session. Looking at the day ahead, it’s not the most exciting for data releases with the October budget balance for France and October PPI report for the Euro Area the only prints of note. There’s nothing of note in the US however we are due to hear from the Fed’s Williams this afternoon when he holds a press briefing at the NY Fed. BoE Governor Carney is also due to attend a hearing of the Treasury Committee on the Brexit Withdrawal Agreement. Also in credit we’ve just published our two monthly chartbooks. The PowerPoint based one on global credit trends including issuance, flows, performance and relval ( link ) and also the excel based US credit strategy one with everything you wanted to know about US credit in a spreadsheet including up to date fundamentals ( link ). Elsewhere in today’s PDF link we’ve updated our PMI vs equities analysis. It shows equities as ‘cheap’ at the moment to current activity levels. Click on the full link for this report at the top for more with the commentary below. Bourses yesterday closed well off their early highs with the follow through from the trade ceasefire a little disappointing. This reversal has continued in Asia to a large degree with the Nikkei (-1.72%), Hang Seng (-0.52%) and Kospi (-0.95%) all lower alongside most markets while the Shanghai Comp (+0.04%) is flattish. 10yr USTs yields are 11bps lower than their peak yesterday at 2.939% (-3bps this morning) with the curve flattening further (see below). S&P 500 futures are down -0.58% as we type. Notwithstanding these disappointments, the reality is that yesterday US stocks did continue on what was a strong rebound from last week. Indeed after taking into account the +1.09% jump yesterday the S&P 500 is now up +5.99% over the last six sessions which is the strongest such run since February 2016 and second strongest since 2011. Tech led the way yesterday with the NASDAQ rallying +1.51% and the NYSE FANG index returning +2.80%. This was after the STOXX 600 finished +1.03% in Europe and the DAX +1.85% - albeit with both also closing off the early session highs. It was a similarly strong day for credit with Euro and US high yield cash spreads tightening -6.5bps and -11.7bps respectively – the latter by the most in a month. Despite the lack of follow through, there were some outsized winners. President Trump’s tweet about China agreeing to “reduce and remove tariffs on cars coming into China from the US” helped the S&P 500 autos sector to close +2.14% with Euro autos also surging +3.04%. In addition to that, we had the +4.30% jump for WTI oil (an extra +1% in Asia this morning) on the OPEC +/ Alberta production cuts stories we discussed yesterday. Markets are also digesting Qatar’s decision to exit OPEC from January 2019. Qatar has been a member since 1961 and while it’s not a huge volume contributor, the suggestion was that the country’s role as a diplomat had been significant. So a bit more uncertainty in the oil market. A reminder that the much anticipated OPEC meeting arrives Thursday/Friday. Treasuries also reversed the post G-20 sell-off, which saw a +6.0bp climb this time yesterday result in a flat close. Two-year USTs did rise +3.5bps though leading to the 2s10s curve flattening to only 15bps (down to 13.5bps in Asia with 10yr another -3bps) and to the lowest in the current cycle. There was also some talk of 5 year notes inverting through both 3- and 2-year notes for the first time in this cycle as well. So the curve is getting very flat, especially at this point. As a reminder 2s10s has inverted ahead of all the last 9 recessions. The good news is we haven’t inverted yet and that the average time between the two is 16 months, with the quickest being 9 months. So we have some breathing space if history is your guide. The bad news is that we’re getting closer and closer and a circuit break to this flattening would be helpful to risk and the economy over the medium-term. Several factors have combined to support the flattening move. The big rally in oil supported near-term inflation breakevens, with 2-year breakeven up +4.7bps and driving the entire move in nominal 2-year yields. Ten-year inflation breakevens were flat, explaining the flattening yield curve. WTI oil prices and 2-year breakevens have a high positive correlation of around 0.75. After both peaked on October 3, the former is down -30.5% and the latter has fallen by -57.0bps. At the long end, a steady flow of real money into Treasuries weighed on yields, possibly just due to rebalancing on the first day of the month after equities outperformed versus fixed income in November. To a lesser extent, markets continued to focus on communications from Fed officials, though comments yesterday from Fed Board Members Clarida, Quarles, and Brainard broadly met expectations and confirmed the sentiment from Powell’s speech last week (note that Powell’s Wednesday congressional testimony has been cancelled and not yet rescheduled due to the President Bush’s funeral). They reiterated the recent emphasis on data dependency and described the economy as at or near full employment and inflation as at target. In the US, the final manufacturing PMI was revised down 0.1pts to 55.3 however the more important ISM manufacturing printed at 59.3 (vs. 57.5 expected) and jumped 1.6pts from October. That’s still below the 61.3 high made back in August but was clearly reassuring in the face of some more mixed data of late. New orders (62.1 vs. 57.4 previously) and employment (58.4 vs. 56.8 previously) also lept higher, however the softer inflation story was maintained with prices paid falling over 10pts to 60.7 (vs. 70.0 expected). Some suggested that seasonals may have slightly distorted the decline. Another small negative was the fairly benign new export orders reading (52.2) which failed to climb from October. Making less of a mark yesterday were the final global November manufacturing PMIs in Europe. Indeed the final Eurozone reading was revised up from the flash reading of 51.5 to 51.8 but was still the lowest since August 2016. That upward revision was helped by modest 0.2pts and 0.1pt upward revisions to Germany (to 51.8) and France (to 50.8), however these readings are also the lowest in 31 months and 26 months, respectively. Italy fell further below 50 to 48.6 and is now at a 47-month low, however, there was better news for Spain (52.6 and 3-month high) and Ireland (55.4 and 2-month high). Greece is even back to a 6-month high at 54.0, which means the 2.2pt differential over Germany is the highest based on data back to 2014. Meanwhile, there was a notable upward surprise in the UK (53.1 vs. 51.7 expected), a jump of 2pts from October and seemingly supported by domestic contracts picking up. In contrast, exports dropped for the second straight month with the report noting external weakness. Outside of Europe, China catches the eye with the Shanghai Comp actually 27% ‘cheap’ compared to the implied PMI. Interestingly only the S&P 500 is pricing in an implied PMI above 50 with Europe in the 45-48 range and China 46.9. We try not to over-analyse these results, preferring to use them to look at more general levels of global under/over valuations. However, they do support our view that markets have probably got a bit too negative of late. Over in Italy, two- and 10-year yields fell -17.4bps and -6.8bps yesterday as headlines suggested policymakers were receptive to less confrontational budget deficit targets. Prime Minister Conte is reportedly aiming to convince Salvini and Di Maio to shift the budget deficit from 2.4% to below 2.0%. The latest economic data (yesterday’s included), which has shown a marked slowdown in growth momentum amid the higher BTP yields, may be incentivising policymakers to back away from their more confrontational stance. However these were all headlines. There’s no firm evidence as yet that the deficit target will be markedly lower but the momentum seems to be moving in that direction. However last night Ansa reported Italian Premier Conte as saying that he is not trying to cut the budget deficit to below 2%. Last night in the UK, Parliamentary Speaker Bercow granted an emergency debate to determine whether or not Prime Minister May is in contempt of Parliament over her refusal to release the government’s full legal advice about the proposed Withdrawal Agreement. The debate will take place when Parliament convenes this morning, and it currently looks likely that May will lose a vote, since lawmakers from both sides of the aisle have expressed their interest to see the information. As for the day ahead, it’s not the most exciting for data releases with the October budget balance for France and October PPI report for the Euro Area the only prints of note. There’s nothing of note in the US however we are due to hear from the Fed’s Williams this afternoon when he holds a press briefing at the NY Fed. BoE Governor Carney is also due to attend a hearing of the Treasury Committee on the Brexit Withdrawal Agreement.